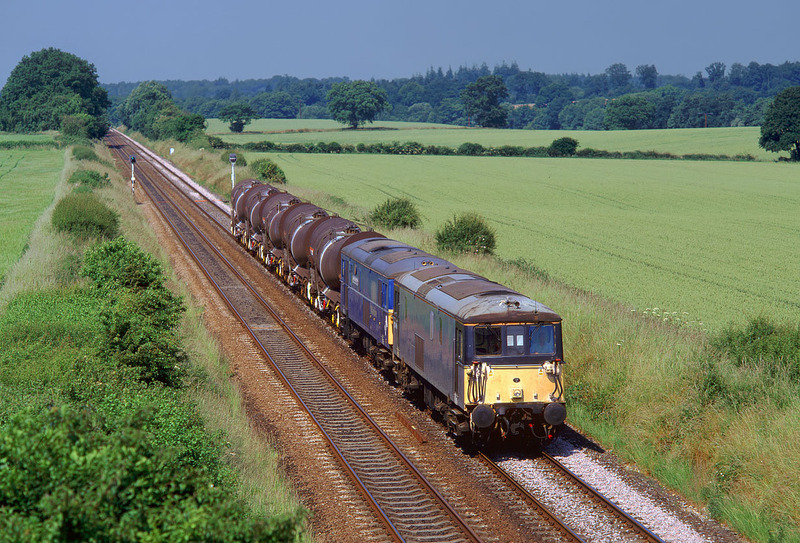 On 25 June 1999, the Eastleigh Yard to Quidhampton and return china clay tanks were worked by 73106 & 73133 The Bluebell Railway in place of the usual Class 58. After seeing the train leave Eastleigh in the morning, it was just a question of finding a suitable spot for the return working, and hoping that the good weather would hold. As you can see, there was not a cloud in the sky when the pair passed East Grimstead (between Salisbury and Romsey) with the 6Y27 10:28 Quidhampton to Eastleigh Yard loaded tanks. Pictures of 73s working freights on the main line away from the 750v third rail were always at a premium, but the load here is hardly going to tax their combined 1200hp diesel power!